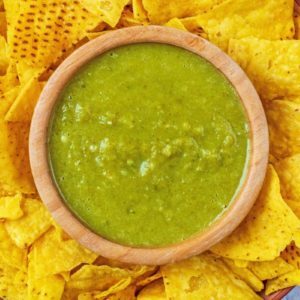 This easy Jalapeno Sauce is one of those sauces that you want to put on everything. It’s not for the faint-hearted, as it has a serious kick to it. But, if you are serious about your chilli sauces, then you should try this homemade version. 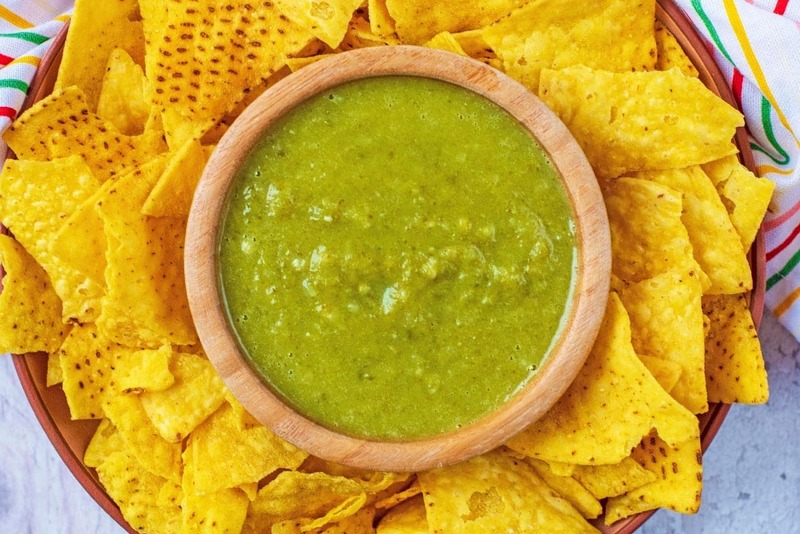 Dip tortilla chips in it, or drizzle it over tacos – this sauce has so many uses. 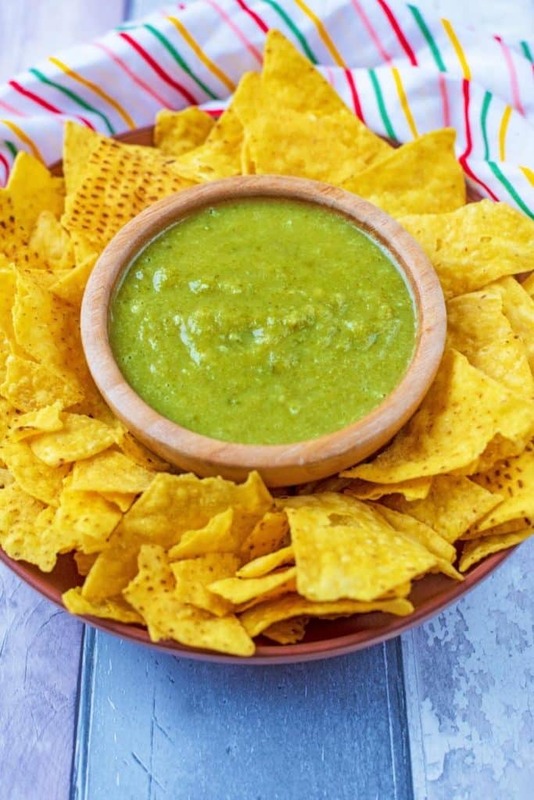 This vibrant green chili sauce makes a delicious dip or sauce to add to your meals and it would definitely get your guests talking at a party. Jalapenos are far from the spiciest chilli out there, but this is still a pretty spicy sauce because of the amount of peppers we have packed in to it. We grew our own jalapenos this summer and because we had so many of them, we were always making this sauce so none went to waste. If there is one thing we are absolutely made about in our house, it’s sauces! You only have to look at the top shelf of our fridge to see that. We love trying out anything new on the market, especially if it is spicy. I would guess about 10% of our monthly shopping budget goes on sauces, and that’s kind of crazy. So, in a bid to not have to remortgage to be able to afford our sauce habit, we have been making our own sauces and we make a lot of chilli sauce. If you prefer creamier sauces, then take a few tablespoons of this and stir it through some sour cream or Greek yoghurt. It makes it a much milder sauce, but does bump up the calories and makes it not vegan (unless you use a vegan alternative). How Long Does This Sauce Keep For? This sauce will keep in an air tight container for around 5 days for maximum freshness. If you won’t be able to get through all this in that amount of time, then you can always adjust the quantities. This makes a nice batch size to serve as a dip at a party. Just try and stop yourself from eating it with a spoon! But for those of you that not love chilli sauce *quite* that much, then there is SO much that you can do with this sauce. It makes a great dip for some tortilla chips and you will feel the full effect of the spice that way. It’s great drizzled over tacos and enchiladas or even vegetables to liven them up a little. Oh, and on burgers, or stirred in to mac and cheese. SO much that you can do with it. One: Slice up all the jalapenos. Two: Heat the oil in a pan and add the shallots, garlic and jalapenos and gently cook for 3 minutes. Three: Add the rest of the ingredients and simmer for 15 minutes. Four: Allow the mixture to cool and then pour in to a food processor. Add some extra flavour to this sauce by throwing some fresh coriander in to the food processor just before blending. If you love a creamy dip, then add a couple of spoonfuls of this to some sour cream of Greek yoghurt – it will be a much milder dip. If you want all of the flavour from the jalapenos, but not as much of the spice, then de-seed the jalapenos first. Add a little bit more of fresh flavour to this chilli sauce with a squeeze of lime juice in it. 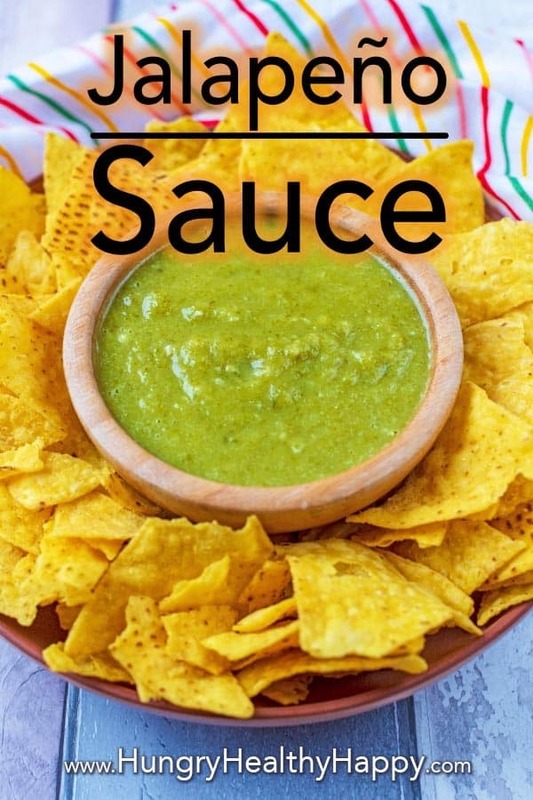 This easy Jalapeno Sauce is one of those sauces that you want to put on everything. It's not for the faint-hearted, as it has a serious kick to it. But, if you are serious about your chilli sauces, then you should try this homemade version. 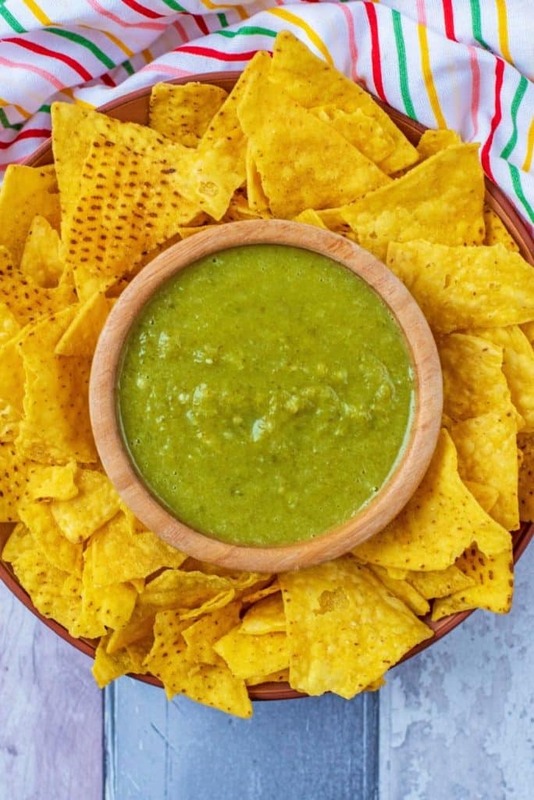 Dip tortilla chips in it, or drizzle it over tacos - this sauce has so many uses. Slice up all the jalapenos. Heat the oil in a pan and add the shallots, garlic and jalapenos and gently cook for 3 minutes. Allow the mixture to cool and then pour in to a food processor. If you love a creamy dip, then add a couple of spoonfuls of this to some sour cream of Greek yoghurt - it will be a much milder dip. I love a recipe with a little kick, this is right up my alley, will definitely be trying this one! This really packs a punch of flavor! I love spicy things and this was perfection. Love the idea of adding it to some sour cream. I’m so ready to start dipping! look at those beautiful jalapenos! i’ll bet this sauce is just incredible. I can imagine all the things it would be great on! Delicious! I adore jalapenos (obviously, I partially named my blog after them, lol). This seems like a fantastic way to use them up if you have too many sitting around – especially for home gardeners. I’ll definitely join you with the spoon! Sounds amazing. There’s so many ways you can use this sauce! I made this for taco Tuesday yesterday, and it was a hit! Can’t wait to make it again! My husband loooves chilli sauces, and I’m sure that he’s going to love this one as he loves making a good homemade chilli sauce. Sounds wonderful! My family loves spicy things and this will be one of their favorites. 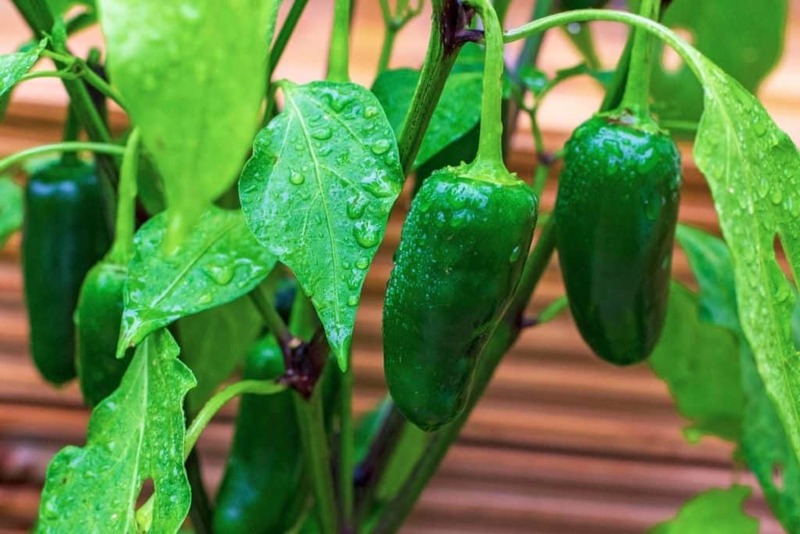 How great to grow your own jalapenos! I should try growing them. Here in Italy I can only find them in jars and I love the taste. Need to find some seeds and grow some jalapenos so I can make this sauce! I can already hear my husband complaining about how spicy this dip is, but I have to try it anyways. I think this will be so good drizzled over enchiladas! You Jalapeno Sauce sounds like a spicy and delicious sauce. I bet my hubby would love it. I am a HUGE fan of Jalapenos! This is definitely going into my go-to recipes! Oh wow this looks fantastic + it’s super easy to make at home. I must give it a try. I never done it homemade. I always buy this in stores. but homemade is so much better, right? Fresh Jalapenos can be the best thing ever & your sauce looks damn delicious, look at that gorgeous color! Thanks for the share. Oh yum. This is such a great way to mix it up, instead of just plain salsa all the time. My husband loves the spice and so do I, just in lesser quantities! My husband is a fan of spicy foods. He would love this jalapeno sauce. It’s great how versatile this sauce is too. Great idea to stir into mac and cheese. We are not afraid of spice in this house, so you are preaching to the choir with this stunning jalapeno sauce. I can just imagine it on my tacos, eggs and to spice up all manner of casserole or soup! Perfection!